Este CD é de uma inspiração, de uma magia inigualável. Penetra fundo em minh'alma, fazendo-me sentir a pessoa mais feliz e de bem com a VIDA. Lindo demais! I just loved the cd, it is music inspired by angels, it is a music which makes you medidate and brings you to heaven. Aeoliah's style with a new different and modern sound. Beautifully entwined elegant and mystical woman's voice. An excellent addition to my Aeoliah's CD collection. This beautiful music gently connect me to my soul and heart ! this beautiful music! I am reiki master for 2 years ! 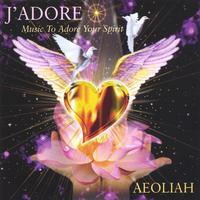 I have Aeoliah's CD J'Adore and have all of the tracks playing on my internet radio station, ARIES' ERA, at live365.com. He has truly been touched by the hand of God and his music is the halo around ARIES' ERA; bringing such a peaceful and loving feel to it. Thank you, Aeoliah, for being amongst us, sharing your most beautiful talents, and for the voiceovers you recently created for ARIES' ERA. Bless you and peace, my dear friend. El amor ni se puede,ni tiene definición;es un sentimiento inherente al Ser Humano.Pero si se buscara algo definitorio,habrá que escuchar su música y no con los oidos,sino con el corazón.